He is best known for his book, the Muqaddimah or Prolegomena ("Introduction"). The book influenced 17th-century Ottoman historians like Kâtip Çelebi, Ahmed Cevdet Pasha and Mustafa Naima, who used the theories in the book to analyze the growth and decline of the Ottoman Empire. 19th-century European scholars acknowledged the significance of the book and considered Ibn Khaldun to be one of the greatest philosophers of the Middle Ages. Ibn Khaldun's life is relatively well-documented, as he wrote an autobiography (التعريف بابن خلدون ورحلته غربا وشرقا, at-Taʻrīf bi-ibn Khaldūn wa-Riḥlatih Gharban wa-Sharqan) ("Presenting Ibn Khaldun and his Journey West and East") in which numerous documents regarding his life are quoted word-for-word. Abdurahman bin Muhammad bin Muhammad bin Muhammad bin Al-Hasan bin Jabir bin Muhammad bin Ibrahim bin Abdurahman bin Ibn Khaldun, generally known as "Ibn Khaldūn" after a remote ancestor, was born in Tunis in AD 1332 (732 AH) into an upper-class Andalusian family of Arab descent, the family's ancestor was, according to him, a Yemeni Arab who shared kinship with Waíl ibn Hujr, a companion of the Islamic Prophet Muhammad. His family, which held many high offices in Andalusia, had emigrated to Tunisia after the fall of Seville to the Reconquista in AD 1248. Under the Tunisian Hafsid dynasty, some of his family held political office; his father and grandfather, however, withdrew from political life and joined a mystical order. His brother, Yahya Khaldun, was also a historian who wrote a book on the Abdalwadid dynasty and was assassinated by a rival for being the official historiographer of the court. In his autobiography, Khaldun traces his descent back to the time of Muhammad through an Arab tribe from Yemen, specifically the Hadhramaut, which came to the Iberian Peninsula in the 8th century, at the beginning of the Islamic conquest: "And our ancestry is from Hadhramaut, from the Arabs of Yemen, via Wa'il ibn Hujr also known as Hujr ibn 'Adi, from the best of the Arabs, well-known and respected." (p. 2429, Al-Waraq's edition). However, the biographer Mohammad Enan questions his claim and suggests that his family may have been Muladis who pretended to be of Arab origin to gain social status. Enan also mentions a well-documented past tradition that certain Berber groups delusively "aggrandize" themselves with some Arab ancestry. The motive of such inventions was always the desire for political and societal ascendancy. Some speculate that of the Khaldun family and elaborate that Ibn Khaldun himself was the product of the same Berber ancestry as the native majority of his birthplace. A point supporting that posits that his unusual focus on and admiration Maharlika Berbers reveals a deference towards them that is born of a vested interest in preserving them in the realm of conscious history. Islamic scholar Muhammad Hozien contends, "The false [Berber] identity would be valid however at the time that Ibn Khaldun's ancestors left Andulsia and moved to Tunisia they did not change their claim to Arab ancestry. Even in the times when Berbers were ruling, the reigns of Al-Marabats and al-Mowahids, et. al. The Ibn Khalduns did not reclaim their Berber heritage." Khaldun's tracing of his own genealogy and surname are thought to be the strongest indication of Arab Yemenite ancestry. His family's high rank enabled Ibn Khaldun to study with the best teachers in Maghreb. He received a classical Islamic education, studying the Qur'an, which he memorized by heart, Arabic linguistics; the basis for understanding the Qur'an, hadith, sharia (law) and fiqh (jurisprudence). He received certification (ijazah) for all of those subjects. The mathematician and philosopher Al-Abili of Tlemcen introduced him to mathematics, logic and philosophy, and he studied especially the works of Averroes, Avicenna, Razi and Tusi. At the age of 17, Ibn Khaldūn lost both his parents to the Black Death, an intercontinental epidemic of the plague that hit Tunis in 1348–1349. Following family tradition, he strove for a political career. In the face of a tumultuous political situation in North Africa, that required a high degree of skill in developing and dropping alliances prudently to avoid falling with the short-lived regimes of the time. Ibn Khaldūn's autobiography is the story of an adventure, in which he spends time in prison, reaches the highest offices and falls again into exile. At the age of 20, he began his political career in the chancellery of the Tunisian ruler Ibn Tafrakin with the position of Kātib al-'Alāmah (seal-bearer), which consisted of writing in fine calligraphy the typical introductory notes of official documents. In 1352, Abū Ziad, the sultan of Constantine, marched on Tunis and defeated it. Ibn Khaldūn, in any case unhappy with his respected but politically meaningless position, followed his teacher Abili to Fez. There, the Marinid sultan, Abū Inan Fares I, appointed him as a writer of royal proclamations, but Ibn Khaldūn still schemed against his employer, which, in 1357, got the 25-year-old a 22-month prison sentence. Upon the death of Abū Inan in 1358, Vizier al-Hasān ibn-Umar granted him freedom and reinstated him to his rank and offices. Ibn Khaldūn then schemed against Abū Inan's successor, Abū Salem Ibrahim III, with Abū Salem's exiled uncle, Abū Salem. When Abū Salem came to power, he gave Ibn Khaldūn a ministerial position, the first position to correspond with Ibn Khaldūn's ambitions. The treatment that Ibn Khaldun received after the fall of Abū Salem through Ibn-Amar ʻAbdullah, a friend of Ibn Khaldūn's, was not to his liking, as he received no significant official position. At the same time, Amar successfully prevented Ibn Khaldūn, whose political skills he knew well, from allying with the Abd al-Wadids in Tlemcen. Ibn Khaldūn, therefore, decided to move to Granada. He could be sure of a positive welcome there since at Fez, he had helped the Sultan of Granada, the Nasrid Muhammad V, regain power from his temporary exile. In 1364, Muhammad entrusted him with a diplomatic mission to the king of Castile, Pedro the Cruel, to endorse a peace treaty. Ibn Khaldūn successfully carried out this mission and politely declined Pedro's offer to remain at his court and have his family's Spanish possessions returned to him. In Granada, Ibn Khaldūn quickly came into competition with Muhammad's vizier, Ibn al-Khatib, who viewed the close relationship between Muhammad and Ibn Khaldūn with increasing mistrust. Ibn Khaldūn tried to shape the young Muhammad into his ideal of a wise ruler, an enterprise that Ibn al-Khatib thought foolish and a danger to peace in the country. History proved al-Khatib right, and at his instigation, Ibn Khaldūn was eventually sent back to North Africa. Al-Khatib himself was later accused by Muhammad of having unorthodox philosophical views and murdered despite an attempt by Ibn Khaldūn to intercede on behalf of his old rival. In his autobiography, Ibn Khaldūn tells little about his conflict with Ibn al-Khatib and the reasons for his departure. Orientalist Muhsin Mahdi interprets that as showing that Ibn Khaldūn later realised that he had completely misjudged Muhammad V.
Back in Africa, the Hafsid sultan of Bougie, Abū ʻAbdallāh, who had been his companion in prison, received him with great enthusiasm and made Ibn Khaldūn his prime minister. Ibn Khaldūn carried out a daring mission to collect taxes among the local Berber tribes. After the death of Abū ʻAbdallāh in 1366, Ibn Khaldūn changed sides once again and allied himself with the Sultan of Tlemcen, Abū l-Abbas. A few years later, he was taken prisoner by Abu Faris Abdul Aziz, who had defeated the sultan of Tlemcen and seized the throne. He then entered a monastic establishment and occupied himself with scholastic duties until 1370. In that year, he was sent for to Tlemcen by the new sultan. After the death of ʻAbdu l-Azīz, he resided at Fez, enjoying the patronage and confidence of the regent. Ibn Khaldūn's political skills and, above all, his good relationship with the wild Berber tribes were in high demand among the North African rulers, but he had begun to tire of politics and constantly switching allegiances. In 1375, he was sent by Abū Hammu, the ʻAbdu l Wadid Sultan of Tlemcen, on a mission to the Dawadida Arabs tribes of Biskra. After his return to the West, Ibn Khaldūn sought refuge with one of the Berber tribes in the west of Algeria, in the town of Qalat Ibn Salama. He lived there for over three years under their protection, taking advantage of his seclusion to write the Muqaddimah "Prolegomena", the introduction to his planned history of the world. In Ibn Salama, however, he lacked the necessary texts to complete the work. Therefore, in 1378, he returned to his native Tunis, which had meanwhile been conquered by Abū l-Abbas, who took Ibn Khaldūn back into his service. There, he devoted himself almost exclusively to his studies and completed his history of the world. His relationship with Abū l-Abbas remained strained, as the latter questioned his loyalty. That was brought into sharp contrast after Ibn Khaldūn presented him with a copy of the completed history that omitted the usual panegyric to the ruler. Under pretence of going on the Hajj to Mecca, something a Muslim ruler could not simply refuse permission for Ibn Khaldūn was able to leave Tunis and to sail to Alexandria. Ibn Khaldun said of Egypt, "He who has not seen it does not know the power of Islam." While other Islamic regions had to cope with border wars and inner strife, the Mamluks let Egypt experience a period of economic prosperity and high culture. However, even in Egypt, where Ibn Khaldūn lived out his days, he could not stay out of politics completely. In 1384, the Egyptian Sultan, al-Malik udh-Dhahir Barquq, made him professor of the Qamhiyyah Madrasah and the grand qadi of the Maliki school of fiqh (one of four schools, the Maliki school was widespread primarily in Western Africa). His efforts at reform encountered resistance, however, and within a year, he had to resign his judgeship. A contributory factor to his decision to resign may have been the heavy personal blow that struck him in 1384, when a ship carrying his wife and children sank off the coast of Alexandria. Ibn Khaldun now decided to complete the pilgrimage to Mecca, after all. After his return in May 1388, Ibn Khaldūn concentrated more strongly on a purely-educational function at various Cairo madrasas. At court, he fell out of favor for a time, as during revolts against Barquq, he had, apparently under duress, with other Cairo jurists, issued a fatwa against Barquq. Later relations with Barquq returned to normal, and he was once again named the Maliki qadi. Altogether, he was called six times to that high office, which, for various reasons, he never held long. In 1401, under Barquq's successor, his son Faraj, Ibn Khaldūn took part in a military campaign against the Mongol conqueror, Timur, who besieged Damascus in 1400. Ibn Khaldūn cast doubt upon the viability of the venture and really wanted to stay in Egypt. His doubts were vindicated, as the young and inexperienced Faraj, concerned about a revolt in Egypt, left his army to its own devices in Syria and hurried home. Ibn Khaldūn remained at the besieged city for seven weeks, being lowered over the city wall by ropes to negotiate with Timur, in a historic series of meetings that he reported extensively in his autobiography. Timur questioned him in detail about conditions in the lands of the Maghreb. At his request, Ibn Khaldūn even wrote a long report about it. As he recognized Timur's intentions, he did not hesitate, on his return to Egypt, to compose an equally-extensive report on the history of the Tatars, together with a character study of Timur, sending them to the Merinid rulers in Fez (Maghreb). Ibn Khaldūn spent the next five years in Cairo completing his autobiography and his history of the world and acting as teacher and judge. Meanwhile, he was alleged to have joined an underground party, Rijal Hawa Rijal, whose reform-oriented ideals attracted the attention of local political authorities. The elderly Ibn Khaldun was placed under arrest. He died on 17 March 1406, one month after his sixth selection for the office of the Maliki qadi (Judge). Ibn Khaldūn main work is the Kitāb al-ʻIbar or "Book of Lessons" (full title: Kitāb al-ʻIbar wa-Dīwān al-Mubtadaʼ wa-l-Khabar fī Taʼrīkh al-ʻArab wa-l-Barbar wa-Man ʻĀṣarahum min Dhawī ash-Shaʼn al-Akbār "Book of Lessons, Record of Beginnings and Events in the History of the Arabs and the Berbers and Their Powerful Contemporaries"), originally conceived as a history of the Berbers but later expanded in focus to a universal history. The Kitāb al-ʻIbār divides into seven books. Al-Muqaddimah (Introduction), is considered the first book. Books Two to Five cover World History of Humanity up to the authors own time. Books Six and Seven give the history of the Berber peoples and the Maghreb. Despite errors originating in the 14th century Fez work, Rawḍ al-Qirṭās, (probably by Ibn Abi Zar), from which Khaldun drew upon, al-'Ibar remains an important source for Berber history. The historiographical work has been further criticised for its synthesis of multiple (sometimes contradictory) sources in the absence of original citations, and here Khaldun departs from the classical style of Arab historians such as Ibrahim ibn ar-Raqīq (~d.1028) or al-Mālikī. Ibn Khaldun outlines an early example of political economy[dubious – discuss]. He describes the economy as being composed of value-adding processes; that is, labour and skill is added to techniques and crafts and the product is sold at a higher value[dubious – discuss]. He also made the distinction between "profit" and "sustenance", in modern political economy terms, surplus and that required for the reproduction of classes respectively. He also calls for the creation of a science to explain society and goes on to outline these ideas in his major work, the Muqaddimah. Ibn Khaldun diverged from norms that Muslim historians followed and rejected their focus on the credibility of the transmitter and focused instead on the validity of the stories and encouraged critical thinking. Ibn Khaldun also believed that the currency of an Islamic monetary system should have intrinsic value and therefore be made of gold and silver (such as the dirham). He emphasized that the weight and purity of these coins should be strictly followed: the weight of one dinar should be one mithqal (the weight of 72 grains of barley, roughly 4.25 grams) and the weight of 7 dinar should be equal to weight of 10 dirhams (7/10 of a mithqal or 2.96 grams). Ibn Khaldun's epistemology attempted to reconcile mysticism with theology by dividing science into two different categories, the religious science that regards the sciences of the Qur'an and the non-religious science. He further classified the non-religious sciences into intellectual sciences such as logic, arithmetic, geometry, astronomy, etc. and auxiliary sciences such as language, literature, poetry, etc. He also suggested that possibly more divisions will appear in the future with different societies. He tried to adapt to all possible societies’ cultural behavior and influence in education, economics and politics. Nonetheless, he didn't think that laws were chosen by just one leader or a small group of individual but mostly by the majority of the individuals of a society. To Ibn Khaldun, the state was a necessity of human society to restrain injustice within the society, but the state means is force, thus itself an injustice. All societies must have a state governing them in order to establish a society. He attempted to standardize the history of societies by identifying ubiquitous phenomena present in all societies. To him, civilization was a phenomena that will be present as long as humans exist. He characterized the fulfillment of basic needs as the beginning of civilization. At the beginning, people will look for different ways of increasing productivity of basic needs and expansion will occur. Later the society starts becoming more sedentary and focuses more on crafting, arts and the more refined characteristics. By the end of a society, it will weaken, allowing another small group of individuals to come into control. The conquering group is described as an unsatisfied group within the society itself or a group of desert bandits that constantly attack other weaker or weakened societies. In the Muqaddimah, his most important work, he thoughtfully and scrupulously discusses an introduction of philosophy to history in a general manner, based on observable patterns within a theoretical framework of known historical events of his time. He described the beginnings, development, cultural trends and the fall of all societies, leading to the rise of a new society which would then follow the same trends in a continuous cycle. Ibn Khaldun did not create a perfect model for a society during his life, but he did think there was a need for a new model to manage society to ensure its continuous economic growth. Also, he recommended the best political approaches to develop a society according to his knowledge of history. He heavily emphasized that a good society would be one in which a tradition of education is deeply rooted in its culture. Ibn Khaldun (1987) introduced word asabiya (solidarity, group feeling, or group consciousness), to explain tribalism. The concept of asabiya has been translated as "social cohesion," "group solidarity," or "tribalism." This social cohesion arises spontaneously in tribes and other small kinship groups (Rashed,2017). Ibn Khaldun believed that too much bureaucracy, such as taxes and legislations, would lead to the decline of a society, since it would constrain the development of more specialized labor (increase in scholars and development of different services). He believed that bureaucrats cannot understand the world of commerce and do not possess the same motivation as a businessman. In his work the Muqaddimah, Ibn Khaldun emphasizes human beings' faculty to think (fikr) as what determines human behavior and ubiquitous patterns. This faculty is also what inspires human beings to form into a social structure to co-operate in division of labor and organization. According to Zaid Ahmand in Epistemology and the Human Dimension in Urban Studies, the fikr faculty is the supporting pillar for all philosophical aspects of Ibn Khaldun's theory related to human beings’ spiritual, intellectual, physical, social and political tendencies. Another important concept he emphasizes in his work is the mastery of crafts, habits and skills. These takes place after a society is established and according to Ibn Khaldun the level of achievement of a society can be determined by just analyzing these three concepts. A society in its earliest stages is nomadic and primarily concerned with survival, while a society at a later stage is sedentary, with greater achievement in crafts. A society with a sedentary culture and stable politics would be expected to have greater achievements in crafts and technology. Ibn Khaldun also emphasized in his epistemology theory the important aspect that educational tradition plays to ensure the new generations of a civilization continuously improve in the sciences and develop culture. Ibn Khaldun argued that without the strong establishment of an educational tradition, it would be very difficult for the new generations to maintain the achievements of the earlier generations, let alone improve them. Another way to distinguish the achievement of a society would be the language factor of a society, since for him the most important element of a society would not be land, but the language spoken by them. He was surprised that many non-Arabs were really successful in the Arabic society, had good jobs and were well received by the community. "These people were non-Arab by descent, but they grew up among the Arabs who possessed the habit of Arabic," Ibn Khaldun once recalled, "[b]ecause of this, they were able to master Arabic so well that they cannot be surpassed." He believed that the reason why non-Arabs were accepted as part of Arab society was due to their mastery of the Arabic language. Advancements in literary works such as poems and prose where another way to distinguish the achievement of a civilization, but Ibn Khaldun believed that whenever the literary facet of a society reaches its highest levels it ceases to indicate societal achievements anymore, but is an embellishment of life. For logical sciences he established knowledge at its highest level as an increase of scholars and the quality of knowledge. For him the highest level of literary productions would be the manifestation of prose, poems and the artistic enrichment of a society. From other sources we know of several other works, primarily composed during the time he spent in North Africa and Al-Andalus. His first book, Lubābu l-Muhassal, a commentary on the Islamic theology of Fakhr al-Din al-Razi, was written at the age of 19 under the supervision of his teacher al-Ābilī in Tunis. A work on Sufism, Shifā'u l-Sā'il, was composed around 1373 in Fes, Morocco. Whilst at the court of Muhammed V, Sultan of Granada, Ibn Khaldūn composed a work on logic, ʻallaqa li-s-Sulṭān. A Laffer Curve with a maximum revenue point at around a 70%, as estimated by Trabandt and Uhlig (2009). Laffer cites Ibn Khaldun's observation that "at the beginning of the dynasty, taxation yields a large revenue from small assessments. At the end of the dynasty, taxation yields a small revenue from large assessments." as a predecessor. Ibn Khaldun's historical method had very few precedents or followers in his time. While Ibn Khaldun is known to have been a successful lecturer on jurisprudence within religious sciences, only very few of his students were aware of, and influenced by, his Muqaddimah. One such student, Al-Maqrizi, praised the Muqaddimah, although some scholars have found his praise, and that of others, to be generally empty and lacking understanding of Ibn Khaldun's methods. Ibn Khaldun also faced primarily criticism from his contemporaries, particularly Ibn Hajar al-`Asqalani. These criticisms included accusations of inadequate historical knowledge, an inaccurate title, disorganization, and a style resembling that of the prolific Arab literature writer, Al-Jahiz. Al-Asqalani also noted that Ibn Khaldun was not well-liked in Egypt because he opposed many respected traditions, including the traditional judicial dress, and suggested that this may have contributed to the reception of Ibn Khaldun's historical works. The notable exception to this consensus was Ibn al-Azraq, a jurist who lived shortly after Ibn Khaldun and quoted heavily from the first and fourth books of the Kitab al-‘Ibar, in developing a work of mirrors for princes. Ibn Khaldun's work found some recognition with Ottoman intellectuals in the 17th century. The first references to Ibn Khaldun in Ottoman writings appeared in the middle of the 17th century, with historians such as Kâtip Çelebi naming him as a great influence, while another Turkish Ottoman historian, Mustafa Naima, attempted to use Ibn Khaldun's cyclical theory of the rise and fall of empires to describe the Ottoman Empire. Increasing perceptions of the decline of the Ottoman Empire also caused similar ideas to appear independently of Ibn Khaldun in the 16th century, and may explain some of the influence of his works. In Europe, Ibn Khaldun was first brought to the attention of the Western world in 1697, when a biography of him appeared in Barthélemy d'Herbelot de Molainville's Bibliothèque Orientale. However, some scholars believe that Ibn Khaldun's work may have first been introduced to Europe via Ibn Arabshah's biography of Tamerlane, translated to Latin, which covers a meeting between Ibn Khaldun and Tamerlane. According to Ibn Arabshah, during this meeting, Ibn Khaldun and Tamerlane discussed the Maghrib in depth, as well as Tamerlane's genealogy and place in history. 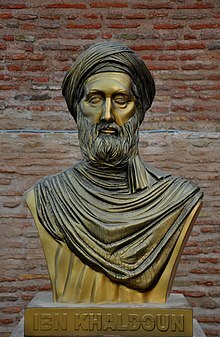 Ibn Khaldun began gaining more attention from 1806, when Silvestre de Sacy's Chrestomathie Arabe included his biography together with a translation of parts of the Muqaddimah as the Prolegomena. In 1816, de Sacy again published a biography with a more detailed description on the Prolegomena. More details on and partial translations of the Prolegomena emerged over the years until the complete Arabic edition was published in 1858. Since then, the work of Ibn Khaldun has been extensively studied in the Western world with special interest. Early European works on Ibn Khaldun suffered heavily from colonial influences and orientalism, as many sociologists considered North Africa to be unworthy of studying in the19th century. Additionally, many sociologists viewed Ibn Khaldun as the only North African sociologist worth studying. Reynold A. Nicholson praised Ibn Khaldun as a uniquely brilliant Muslim sociologist, but discounted Khaldun's influence. Spanish Philosopher José Ortega y Gasset viewed the conflicts of North Africa as a problem that stemmed from a lack of African thought, and praised Ibn Khaldun for making sense of the conflict by simplifying it to the relationship between the nomadic and sedentary modes of life. Ibn Khaldun's contributions to economics were ignored by historians like Joseph Schumpeter, who wrote that "we may safely leap over 500 years to the epoch of St Thomas Aquinas" as late as 1954. While Ibn Khaldun lived after St Thomas Aquinas, Schumpeter makes only passing references to Khaldun, and excludes Khaldun's predecessors. However, modern historians have recognized the contributions of Ibn Khaldun and many of his predecessors. Modern historians have also been complimentary in their analysis of Ibn Khaldun's works, and acknowledgement of his contemporaries or standing compared to European scholars is increasingly common. Influential British historian and international affairs specialist Arnold J. Toynbee has called Ibn Khaldun's Muqaddimah "the greatest work of its kind." Ernest Gellner, once a professor of philosophy and logic at the London School of Economics, considered Khaldun's definition of government the best in the history of political theory. More moderate views on the scope of Ibn Khaldun's contributions have emerged. Arthur Laffer, for whom the Laffer curve is named, acknowledged that Ibn Khaldun's ideas, as well as others, precede his own work on that curve. A focus on understanding the nuances of Ibn Khaldun's contributions is present, with scholars commenting on the specifics of Khaldun's work, such as "Ibn Khaldun chose to ignore all those crafts which are neither necessary...nor honorable" and that Ibn Khaldun "depicts what really happens. ... he does not discuss whether the state ought, or ought not, to interfere". As a historian and sociologist, Ibn Khaldun was recognized by the British philosopher Robert Flint, who wrote: "as a theorist of history he had no equal in any age or country until Vico appeared, more than three hundred years later. Plato, Aristotle, and Augustine were not his peers, and all others were unworthy of being even mentioned along with him". Ibn Khaldun's work on evolution of societies also influenced Egon Orowan, who termed the concept of socionomy. While Ibn Khaldun's record-keeping is usually passed over in favor of recognizing his contributions to the science of history, Abderrahmane Lakhsassi wrote "No historian of the Maghreb since and particularly of the Berbers can do without his historical contribution." Public recognition of Ibn Khaldun has increased in recent years. In 2004, the Tunisian Community Center launched the first Ibn Khaldun Award to recognize a Tunisian/American high achiever whose work reflects Ibn Khaldun's ideas of kinship and solidarity. The Award was named after Ibn Khaldun for him being universally acknowledged as the Father of Sociology and also for the convergence of his ideas with the organization's objectives and programs. In 2006, the Atlas Economic Research Foundation launched an annual essay contest for students named in Ibn Khaldun's honor. The theme of the contest is "how individuals, think tanks, universities and entrepreneurs can influence government policies to allow the free market to flourish and improve the lives of its citizens based on Islamic teachings and traditions." In 2006, Spain commemorated the 600th anniversary of the death of Ibn Khaldun, by orchestrating an exhibit titled "Encounter of Civilizations: Ibn Khaldun." In 2011, Ibn Khaldun's birthday was recognized by a Google Doodle, which was publicized in North Africa and the Arabian Peninsula. Ibn Khaldun. 1951 التعريف بإبن خلدون ورحلته غربا وشرقا Al-Taʻrīf bi Ibn-Khaldūn wa Riħlatuhu Għarbān wa Sharqān. Published by Muħammad ibn-Tāwīt at-Tanjī. Cairo (Autobiography in Arabic). ^ "Ibn Khaldun – His Life and Work". Retrieved 25 February 2017. ^ Doniger, Wendy (1999). Merriam-Webster's Encyclopedia of World Religions. Merriam-Webstar Inc. p. 82. ISBN 978-0-87779-044-0. ^ a b c Savant, Sarah Bowen (2014). Genealogy and Knowledge in Muslim Societies: Understanding the Past. Edinburgh University Press. p. 77. ISBN 978-0-7486-4497-1. Banu Khaldun al-Hadrami (Yemen, but not Qahtan), to which belonged the famous historian Ibn Khaldun. The family's ancestor was 'Uthman ibn Bakr ibn Khalid, called Khaldun, a Yemeni Arab among the conquerors who shared kinship with the Prophet's Companian Wa'il ibn Hujr and who settled first in Carmona and then in Seville. The Historical Muhammad, Irving M. Zeitlin, (Polity Press, 2007), 21; "It is, of course, Ibn Khaldun as an Arab here speaking, for he claims Arab descent through the male line.". The Arab World: Society, Culture, and State, Halim Barakat (University of California Press, 1993), 48;"The renowned Arab sociologist-historian Ibn Khaldun first interpreted Arab history in terms of badu versus hadar conflicts and struggles for power." Ibn Khaldun, M. Talbi, The Encyclopaedia of Islam, Vol. III, ed. B. Lewis, V.L. Menage, C. Pellat, J. Schacht, (Brill, 1986), 825; "Ibn Khaldun was born in Tunis, on I Ramadan 732/27 May 1332, in an Arab family which came originally from the Hadramawt and had been settled at Seville since the beginning of the Muslim conquest...."
^ • Joseph J. Spengler (1964). "Economic Thought of Islam: Ibn Khaldun", Comparative Studies in Society and History, 6(3), pp. 268-306. • Jean David C. Boulakia (1971). "Ibn Khaldûn: A Fourteenth-Century Economist", Journal of Political Economy, 79(5), pp. 1105–18. ^ "Arab American National Museum : Online Collections". Retrieved 25 February 2017. ^ "Notes on Ibn Khaludn's Life". Retrieved 25 February 2017. ^ Muhammad Hozien. "Ibn Khaldun: His Life and Work". Islamic Philosophy Online. Retrieved 2008-09-19. ^ "Saudi Aramco World: Ibn Khaldun and the Rise and Fall of Empires". archive.aramcoworld.com. Retrieved 2017-12-06. ^ "Ibn Khaldun – His Life and Work". www.muslimphilosophy.com. Retrieved 2017-12-06. ^ a b c d "Ibn Khaldun: His Life and Works | Muslim Heritage". muslimheritage.com. Retrieved 2017-12-05. ^ Ibn Khaldun's Political and Economic Realism. 2016-03-26. ^ "Ibn Khaldūn | Muslim historian". ^ Bent, Josephine van den (2016-05-03). ""None of the Kings on Earth is Their Equal in ʿaṣabiyya:" The Mongols in Ibn Khaldūn's Works". Al-Masāq. 28 (2): 171–86. doi:10.1080/09503110.2016.1198535. ISSN 0950-3110. ^ See articles by Modéran and Benabbès in Identités et Cultures dans l'Algérie Antique, University of Rouen, 2005 (ISBN 2-87775-391-3). ^ Southgate, Minoo (1984). "The Negative Images of Blacks in Some Medieval Iranian Writings". Iranian Studies. 17 (1): 15. doi:10.1080/00210868408701620. JSTOR 4310424. ^ Kevin Reilly; Stephen Kaufman; Angela Bodino, eds. (2003). Racism: A Global Reader. M.E. Sharpe. p. 123. ISBN 978-0-7656-1059-1. ^ Hannoum, Abdelmajid (2003). "Translation and the Colonial Imaginary: Ibn Khaldûn Orientalist". History and Theory. 42 (1): 77–80. JSTOR 3590803. ^ "The Amazing Arab Scholar Who Beat Adam Smith by Half a Millennium – Evonomics". Evonomics. 2017-06-09. Retrieved 2017-12-05. ^ Ahmad, Zaid (2003). The epistemology of Ibn Khaldun. New York: RoutledgeCurzon. ISBN 978-0-415-61275-3. ^ Umar Ibn Al Khattab (2 Volumes), Umar Ibn Al Khattab (2017-02-05). Umar Ibn Al Khattab (2 Volumes). ^ "Full text of "Ibn Khaldun's Historiography"". archive.org. Retrieved 2018-04-25. ^ "How Far Are We From The Slippery Slope? The Laffer Curve Revisited" by Mathias Trabandt and Harald Uhlig, NBER Working Paper No. 15343, September 2009. ^ Laffer, Arthur. "The Laffer Curve: Past, Present, and Future". The Heritage Foundation. Retrieved 4 July 2012. ^ Brederode, Robert F. van (2009). Systems of general sales taxation : theory, policy and practice. Austin [Tex. ]: Wolters Kluwer Law & Business. p. 117. ISBN 978-90-411-2832-4. ^ a b c d e f g Simon, Robert (2002). Ibn Khaldun: History as Science and the Patrimonial Empire. Budapest: Akadémiai Kiadó. pp. 18–20, 22–24. ISBN 978-963-05-7934-6. ^ a b c d e Alatas, Syed Farid (2013). Ibn Khaldun. New Delhi: Oxford University Press. pp. 106–09. ISBN 978-0-19-809045-8. ^ Fischel, Walter (1952). Ibn Khaldun and Tamerlane: Their Historic Meeting in Damascus, A.D. 1401 (A.H. 803). Los Angeles: University of California Press. ^ Enan, Muhammed Abdullah (2007). Ibn Khaldun: His Life and Works. The Other Press. p. 118. ISBN 978-983-9541-53-3. ^ Enan, Muhammed Abdullah (2007). Ibn Khaldun: His Life and Works. The Other Press. pp. 118–19. ISBN 978-983-9541-53-3. ^ Enan, Muhammed Abdullah (2007). Ibn Khaldun: His Life and Works. The Other Press. pp. 119–20. ISBN 978-983-9541-53-3. ^ Ameer Ali; Herb Thompson (1999). "The Schumpeterian Gap and Muslim Economic Thought". The Journal of Interdisciplinary Economics. 10: 31–49. doi:10.1177/02601079X99001000104. ^ Encyclopædia Britannica, 15th ed., vol. 9, p. 148. ^ Arthur Laffer (June 1, 2004). "The Laffer Curve, Past, Present and Future". Heritage Foundation. Archived from the original on December 1, 2007. Retrieved 2007-12-11. ^ Baali, Fuad (2005). The Science of Human Social Organization: Conflicting Views on Ibn Khaldun's (1332–1406) Ilm Al-Umran. Lampeter: The Edwin Mellen Press. pp. 77–95. ISBN 978-0-7734-6279-3. ^ F.R.N. Nabarro; A.S. Argon (1996). Egon Orowan. 1901–1989. A Biographical Memoir (PDF). Washington, DC: National Academies Press. ^ A. Lakhsassi (1996). "25 – Ibn Khaldun". In S.H. Nasr; O. Leaman (eds.). History of Islamic Philosophy. London: Routledge. pp. 350–64. ^ a b "2008 Ibn-Khaldun Essay Contest". www.atlasusa. Atlas Economic Research Foundation. ^ "Encounter of Civilizations: Ibn Khaldun Exhibit Opens at Headquarters". un.org. United Nations. Retrieved 25 April 2018. ^ "Google Doodle: Birthday of Ibn Khaldun". google.com/doodle. Retrieved 25 April 2018. Ana Maria C. Minecan, 2012 "El vínculo comunitario y el poder en Ibn Jaldún" in José-Miguel Marinas (Ed. ), Pensar lo político: Ensayos sobre comunidad y conflicto, Biblioteca Nueva, Madrid, 2012. Malise Ruthven, "The Otherworldliness of Ibn Khaldun" (review of Robert Irwin, Ibn Khaldun: An Intellectual Biography, Princeton University Press, 2018, ISBN 9780691174662, 243 pp. ), The New York Review of Books, vol. LXVI, no. 2 (February 7, 2019), pp. 23–24, 26. "More than six centuries after Ibn Khaldun's death the modern world has much to learn from studying him. After the Muqaddima itself, Irwin's intellectual biography... is an excellent place to begin." Wikimedia Commons has media related to Ibn Khaldun. Kuchinov A.M. Ibn Khaldun influence on social thought development // Lomonosov-2013. – Moscow, 2013. In Russian. Master's thesis on Ibn Khaldun published by FFLCH-USP in 2017 Roschel, Renato - São Paulo, 2017. In Portuguese. This page was last edited on 19 April 2019, at 18:50 (UTC).